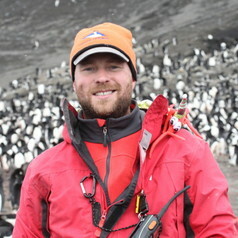 My research centres around how to monitor penguins and other marine predators in difficult environments such as Antarctica (www.penguinlifelines.org). Many of the most important environments on the planet are too data deficient to understand global change and to permit effective management. I spend a lot of time developing tools and techniques to scale up monitoring and data gathering from these environments. I go to lots of remote places around the Southern Ocean - if you need samples that I can collect, please get in touch. Cameras, counts and citizen science. Monitoring animals in such an extreme climate is challenging. Many species spend much of their time at sea, and the environment they live in is both hostile and remote, making the visits required to monitor them, demanding and costly. For these reasons, the monitoring efforts for many penguin colonies in Antarctica and the sub-Antarctic islands have to date, been limited.